Featuring some of the greatest suits ever to appear on screen, could Goldfinger be the most stylish of the James Bond franchises? 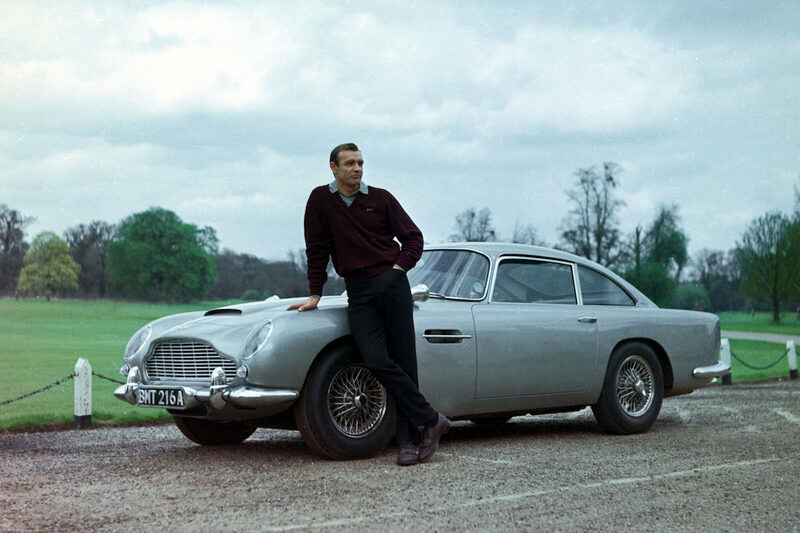 Sean Connery leans against an Aston Martin DB5 while filming Goldfinger. Aside from the regrettable terrycloth onesie that Sean Connery sports poolside at one point, Goldfinger is arguably the best-dressed of all the Bond films. Not only does it provide ample emulation-worthy inspiration insofar as men’s style goes — it also dishes up several cautionary examples of ‘what not to wear’. That powder-blue towelling playsuit is 007’s sole sartorial misstep in the film. The story’s villain, meanwhile, repeatedly serves as an example of finance and refinement failing to coincide. Auric Goldfinger was named after and, in many ways, his personality is based upon the architect Erno Goldfinger, whose brutalist public housing towerblock projects across London Ian Fleming despised. Taking his revenge for these perceived crimes against civic aesthetics, Fleming painted his fictional Goldfinger as a brusque Marxist (like the real-life figure), who despite his vast wealth, is entirely lacking in taste. In Fleming’s books, Bond’s wardrobe is more modest than is depicted on film. In Moonraker and Diamonds Are Forever, he’s described as wearing a “battered” and yellowing “black and white dog-tooth suit for the country and for golf”. In the Goldfinger movie, while the villain’s outfit is faithful to the literary description, 007 looks utterly at leisure in a maroon Slazenger V-neck sweater, grey marle polo shirt, charcoal trousers, a stingy-brimmed grey straw trilby, and dark brown kiltie golf shoes. No “assertive blatancy” whatsoever. While uttering that much-quoted line, “No Mr Bond, I expect you to die,” Auric Goldfinger wears a gaudy brown-gold shantung silk, shawl-lapel dinner jacket — as ugly as his demeanour. Bond’s formalwear in the film, however, is the very picture of dapper discernment. Tailored, like all Connery’s suits for the movie, by Anthony Sinclair, Bond’s iconic ivory tropical wool, one-button dinner jacket features razor-sharp peaked lapels (self-faced, rather than stiff grosgrain or silk), jetted hip pockets and a ventless back. He eschews a fiddly cummerbund and kicks it in midnight blue pleated trousers with satin side detailing. The fancy plissé-front formal shirt 007 wears is cut from a shiny striped white cloth, its French cuffs are fastened with gold cufflinks, and its moderate spread collar sealed with a small, black satin batwing bow-tie. Many say you should never wear a wristwatch with formalwear. Bond says ‘never say never again’, and straps on his trusty Sub. Bond wears several other sterling outfits during this classic 1964 film, but it’s his three-piece at the movie’s denouement that will go down in history as one of the greatest pieces of tailoring ever to grace the silver screen. 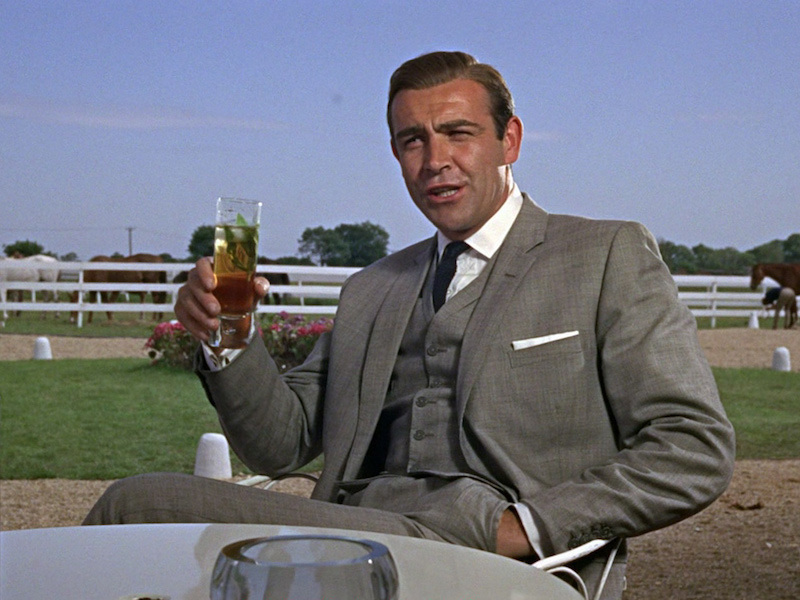 Sippin’ mint juleps at Goldfinger's stud farm in Kentucky and, subsequently, ending the life of his corpulent commie-colluding nemesis, the super spy is super cool in a lightweight micro-glen plaid, two-button suit with six-button waistcoat (with interesting mini lapels) and double forward-pleated trousers. This Anthony Sinclair ‘Conduit Cut’ masterpiece is coupled with a subtly patterned, spread collar, double-cuff white shirt, garrotte-tight four-in-hand knotted navy knit tie, white ‘TV fold’ pocket square and black two-eyelet Derbys (with a handy tracking device in the heel). “Sheminal shuiting,” as Sean himself might put it. We do love Roger Moore. But Connery’s mid-sixties Bond? You’ve got to admit: Nobody did it better. 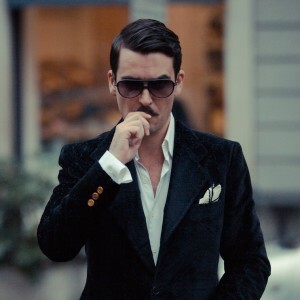 Author’s note: I found the scrupulous sartorial trainspotting of bamfstyle.com and bondsuits.com invaluable resources while researching this story. Hat tip, chaps. Sean Connery, enjoying a refreshing mint julep, wears a lightweight micro-glen plaid three-piece suit by Anthony Sinclair.